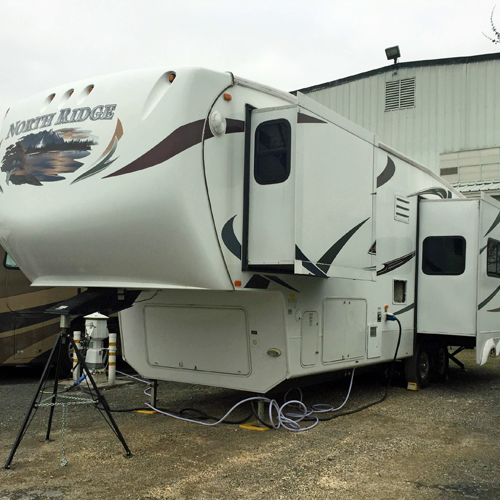 On two occassions we've had to spend some quality time at an RV repair shop. 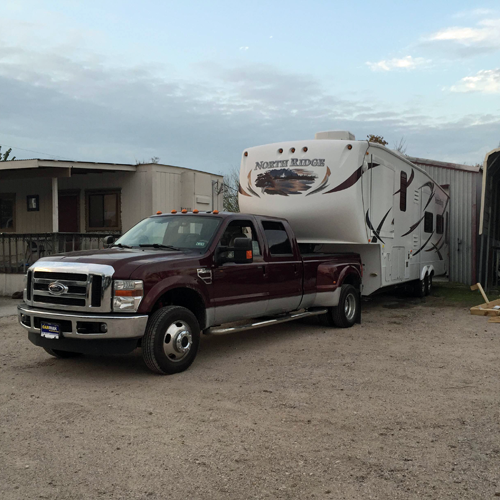 Both places, Best Preowned RV in Houston and Iron Horse RV in San Antonio, have done quality work and have been super accommodating, even allowing us to stay in their parking lots for free. At both places we've had shore power, varying from 30-50 amp. We've also had clean drinking water going straight to our rig. In all honesty, it isn't one, necessarily. People boondock all the time, where they camp without any hookups at all. The problem is when you're sitting still for so long that you approach full and don't really have a convenient way to drain the grey or black tanks. Usually, you can just tow or drive your rig to a nearby dump station, connect a hose straight from the RV to the intake, pull the release valves and wash your troubles away. Both times we've been in the shop, though, we've had truck trouble and been unable to tow our 5th wheel to a dump station. Which meant we had to find a way to dispose of our waste water without moving the rig. If you think you're going to be in this situation, here's our tried and true method. 1. Try to park your rig on high ground. Gravity comes into effect here, so the higher you can get the waste water to start with, the better off you'll be. 2. Buy one of these totes. They're NOT cheap, but they're totally worth it. When you need one, you really need one. One thing to keep in mind before you purchase: measure the distance of your sewer cap from the ground. You want the waste water to flow as little uphill as possible, so the bigger and taller the tote, the more trouble you'll have filling it. It's like a wagon. For poop. 3. When you're ready to get started, hook up a sewer hose from your rig to the top hole in the tote. You'll have to loosen the air release to allow air to flow and water to fill the tote. Fill with black and/or gray water as necessary, keeping in mind the tote's capacity is going to be less than your holding tanks'. 4. 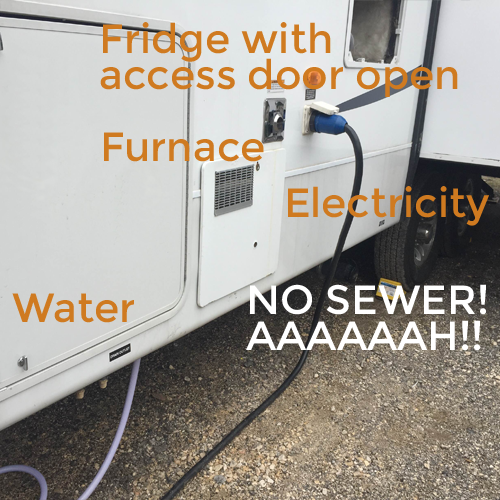 Unhook the sewer connections and close the cap and air release valve to avoid spillage (can we say ew?). Wheel it over to the dump station at a walking speed. Don't tow it with your truck at 35 mph. You may want to bring some leveling blocks to raise it up if you're dealing with a dump station that is higher than ground level. 5. Connect the hose to the hole on the side of the tote and to the dump station. If you're a non-squeamish person who likes to have a clear elbow connector to make sure everything is flowing clean, your clear elbow connection may not fit because of the angle, so you can use a straight clear connector instead. 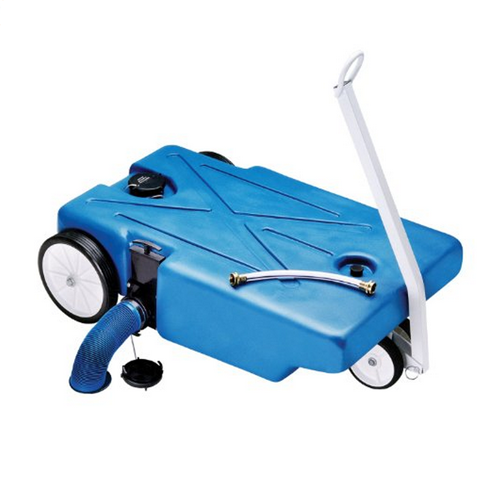 Loosen the air release valve again, then pull on the release by the sewer hose on the tote. Waste water will begin to flow into the dump station. You will have to tilt the tote to get out the last bit of water. Close 'er up. 6. Have patience. This is where it gets tedious, because you may have to repeat steps 3-5. When you're done, clean the inside and outside. Our tote takes up an inordinate amount of space in our basement, but considering how desperately we have needed it several times, it is a more-than-welcome piece of equipment. Do you have any other methods of coping with this issue? Let us know!